Retired Brigadier General Becky Halstead is no stranger to pain. 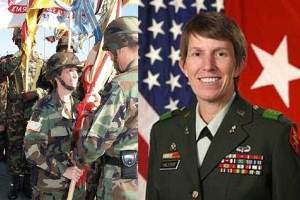 She spent her entire adult life in the military, and was the first female graduate from West Point to become a general officer. She has seen battle all over the world, including in Iraq. But she has also fought her own personal battle—with fibromyalgia. However, it became impossible to continue in the military while dealing with debilitating pain, so she retired from the army in 2008. It was then that she began semi-monthly visits to a chiropractor, and that’s when her health began to turn around. Within a year of beginning chiropractic treatment, she was able to discontinue taking pharmaceuticals entirely by combining regular chiropractic spinal adjustments with nutritional supplements. “If I had known how much chiropractic care would help me when I was a commander in Iraq and in the United States, I could have taken better care of my soldiers.” Although chiropractic care for military personnel was approved by congress, there are still many treatment facilities that do not have a chiropractor on staff, which Halstead would like to see changed.